Can Genetics Explain Hearing Problems? Home > Hearing > Can Genetics Explain Hearing Problems? Some hearing defects are definitely genetic in origin. People with a mutation in one of their genes usually become deaf at an early age and show other signs of their genetic mutation. Waardenburg syndrome is a rare condition that causes deafness. The main types of Waardenburg syndrome occur in people whose PAX3 gene on chromosome 2 has a mutation. The hearing impairment that occurs can be fairly mild, or the deafness can be profound. People affected also tend to have very pale or very blue eyes, or eyes of different colours. Their eyes are set quite widely apart, with the eyebrows often close together and the brow very low. The skin can have white patches and a characteristic feature of the syndrome is a white forelock – an obvious patch of white hair. Although rare in the general population, 1 in 30 people who attend schools for the deaf in the US has tested positively for Waardenburg syndrome. Usher syndrome can leave people deaf and produce vision loss. This genetic syndrome arises when around 10 different genes have mutations and is also quite rare. In its most severe form, Usher syndrome causes profound deafness at birth and a slow deterioration of sight by the age of 10. Other forms of the syndrome are less severe, with vision loss not occurring until middle age. Some of the most badly affected people also experience problems with standing and walking. The syndrome is due to structural problems in the inner ear including the vestibular system, a region that is responsible for balance. Pendred syndrome occurs in just over 7 per cent of people with deafness that has a genetic cause. It leads to hearing problems from birth and can prevent children learning to speak. The loss of hearing gets worse during childhood and can suddenly deteriorate after quite minor knocks to the head. Three quarters of children born with Pendred syndrome also have a goitre – a swelling in the neck cause by an enlarged thyroid gland. The gene that is mutated in Pendred syndrome is the PDS gene on chromosome 4. 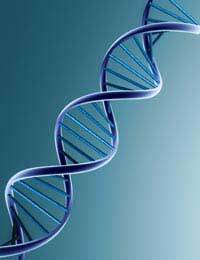 This gene is only expressed in the thyroid, the inner ear and the kidney. For an as yet unknown reason, kidney problems do not occur in those affected. Jervell and Lange-Nielsen syndrome affects less than 6 in every one million children born and produces heart abnormalities as well as deafness. It leads to a very irregular pattern of heartbeats and children with the syndrome are very prone to attacks of fainting. At worst, the heart rhythm becomes completely disrupted and can stop beating, causing sudden death. Alport syndrome is caused by mutations in the gene that codes for collagen, which is found on chromosome 22. Collagen is a vital component of connective tissue in the body and faulty collagen has a wide range of effects, including impaired hearing. Kidney problems are also common with people with Alport syndrome, the lens of the eye can be affected and the blood is unable to clot as effectively. Is Genetic Testing Any Use? With our expanding knowledge of the human genome, all of these syndromes can now be detected using very sensitive genetic tests and we are learning more about them and about the genes involved in normal hearing. For the individual person, knowing they have a specific syndrome can help doctors control their symptoms better, but there is currently no cure for a genetic disorder. In the future, it may be possible to replace the faulty gene using gene therapy, but this research is still at an early stage. One very rare and intriguing genetic disorder that can cause deafness arises because of a mutation in the mitochondrial gene that codes for a component of the ribosome. This tiny cell organelle is crucial for translating the DNA code in the genome into the proteins needed for a healthy body. The exact mechanism has not been worked out, but having this mutation does not generally cause many health problems – but if the affected person takes antibiotics of the aminoglycoside class, this induces drug-related deafness. The mutation makes the inner ear abnormally sensitive to the toxic effects of the antibiotics. A genetic test in this case is very useful. A child found to have a mitochondrial gene mutation of this type can have this recorded in their medical records and can avoid any exposure to aminoglycoside antibiotics, so hopefully preventing or at least delaying the onset of deafness.